This open plan living space embodies the innovative design and superior craftsmanship that sets Neville Johnson apart. The generous space effortlessly combines a library, study and home cinema area in true Neville Johnson style. The library and home cinema area also flow continuously into the home study area which has a number of storage and display options to ensure that all your prize possessions have pride of place while other items can be neatly stored away, allowing you to work in an uncluttered, stress free environment. This dramatic open plan living space incorporates a fabulous home cinema, complete with a large, sophisticated slide up panel that slides away to reveal your TV screen. The wooden beams in the eaves have been carefully considered so the furniture fits almost organically within the space, skillfully incorporating the balcony to ensure a perfect fit with no unsightly gaps. 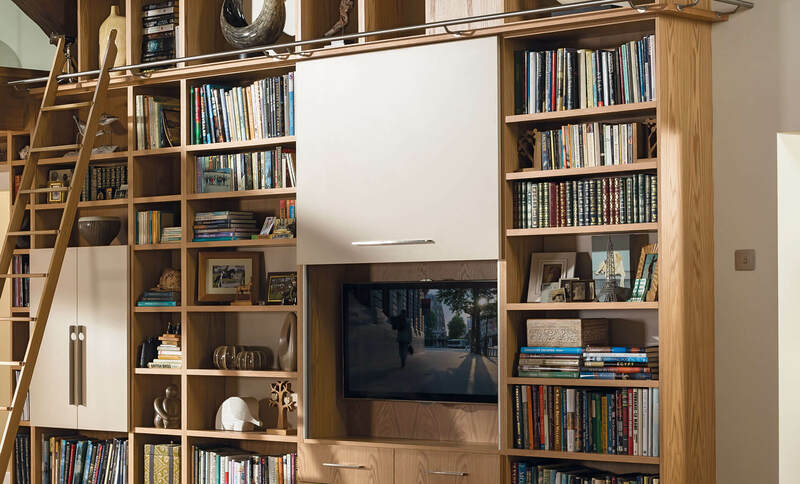 This striking fitted library furniture aligns perfectly to the shape of the room, creating a truly bespoke solution. 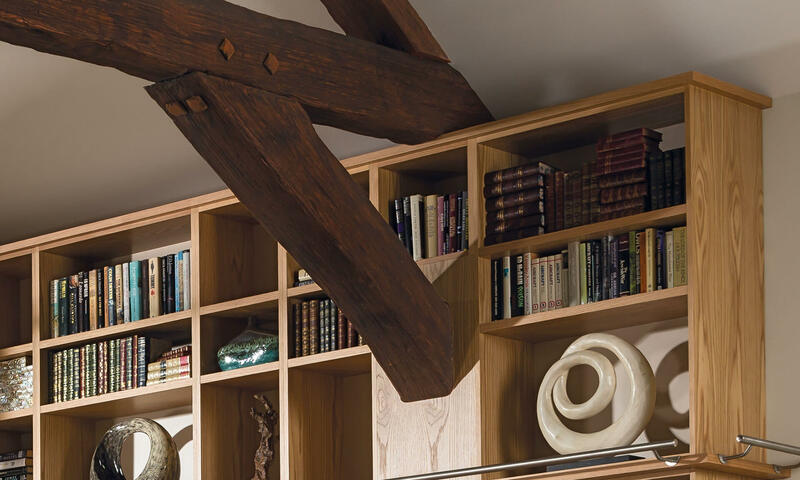 Additional storage is found in the study area, as well as the bespoke coffee table, making this an ideal solution for collections of any size. This hardworking home study and fitted library area features a Y-shaped desk as well as stunning glass fronted cabinets.